Gloves in the German style of the mid-XV century are based on the Milanese hand armor. They have such typical feature, as a fist, completely covered with two segments and two smaller scales for thumb protection. Long wrists have flutes, which are common for Gothic armor. Medieval fencing gloves are kept on the hand with leather straps, installed from the inside. To avoid injury, we do strictly recommend to wear this steel protection only over padded gloves. 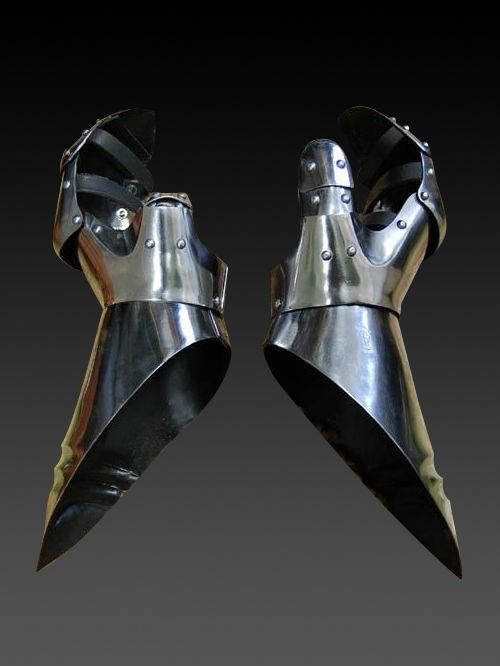 This medieval armor gloves protect hand, wrist and part of the forearm during the fencing or combat; at the same time, plate hand armour does not restrict movements. European plate gloves of the XV century are completely handcrafted by individual parameters of customer. In options, you may choose another type and thickness of metal, color of belts, finish treatment and decoration for your medieval knight gloves. 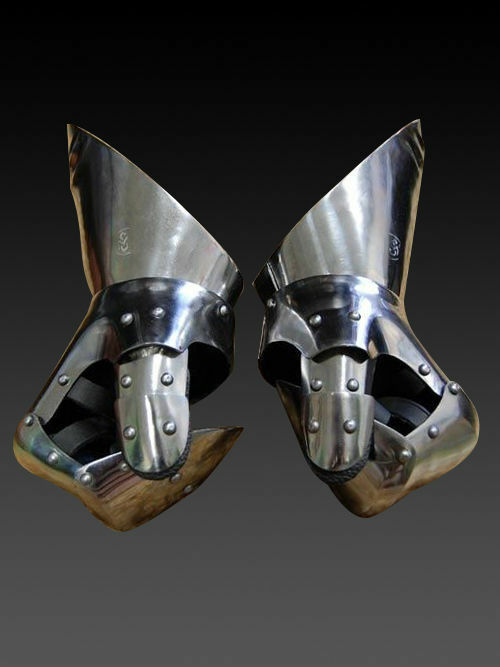 You may also like these models of steel fingerless gloves: Milanese style gauntlets, plate gloves for modern sword fencing. 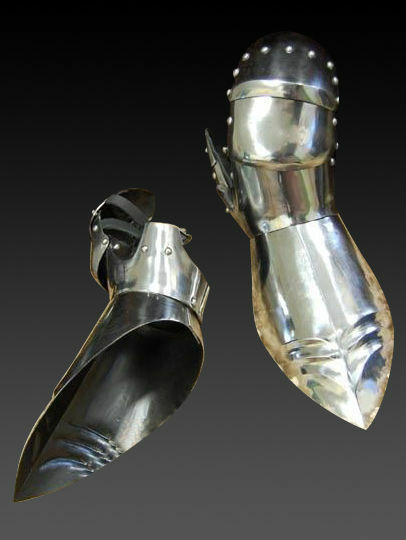 Milan gloves of the 1370-1450 years are an integral part of any Italian style full-plate armor of the XIV-XV centuries. This model of medieval hand armour is based on the sample, which is kept in Churburg Castle now. 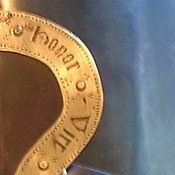 Wrist part is riveted to the plate, which covers outer part of hand. 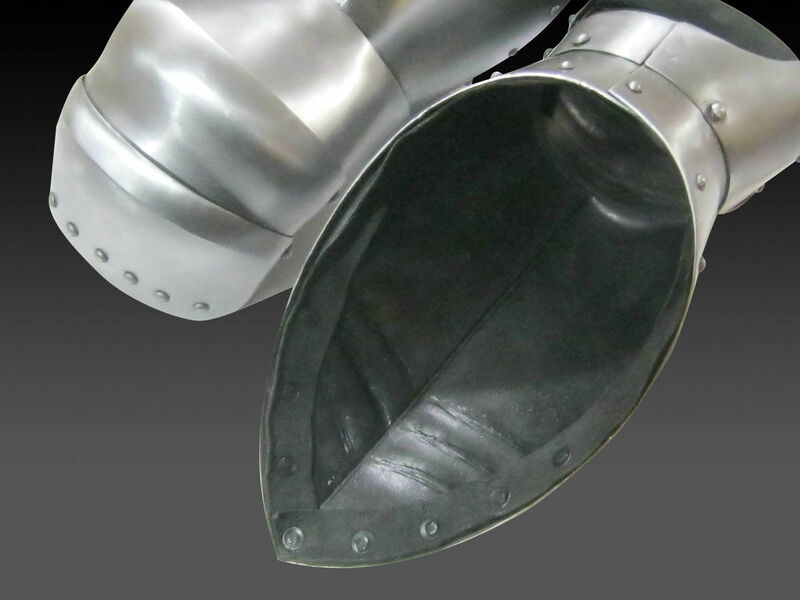 For full protection, we offer you to complete this knight armour with scale, brigand or articulated fingers. The advantage of these steel gloves is prolonged front part of the gauntlet. It protects your fingers from breaking during battle. 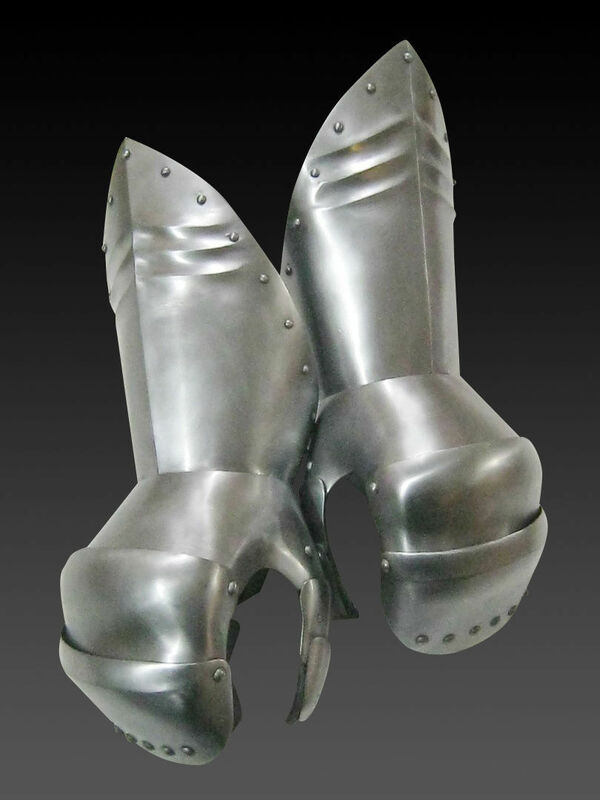 We do recommend to wear such metal hand defense only over leather or padded gloves. By using these Milanese gloves for medieval fencing, comfort and good protection are guaranteed. You can use this battle hand armor for: SCA HEMA Larp Stage performances Medieval festivals Reenactment events Base price includes following options: Cold-rolled steel 1.0 mm; Satin polishing; Brown leather belts; Steel nickel-plated buckles; Steel rivets; No decoration; Painting inside; N..
Classic finger gauntlets are a type of medieval hand protection, which was popular and essential element of knight battle outfit in the XV century. This steel protection has such typical features of Gothic armor, as elongated wrist with reinforcement ribs, articulated fingers and extra plate, which covers knuckles. 'St. George, Triptych with Throning Madonna' (Master of the Antwerp Triptych of Maria), Koninklijk Museum voor Schone Kunsten, Antwerpen, Belgium, ca. 1490-1500 years Small steel scales are riveted to the firm leather base – such design makes fingers’ movements comfortable and easy. Fingered knight gauntlet is fixed on the hand with a belt and buckle. It is recommended to wear this hand armor over the leather glove, to which leather parts could be sewn. 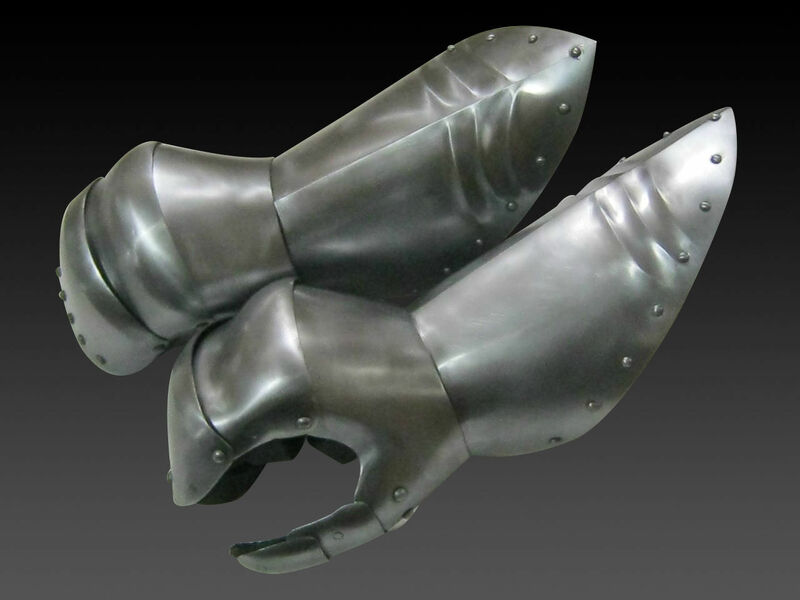 Medieval plate gauntlets don’t restrict movements of hand, that is very important during fencing or battle. 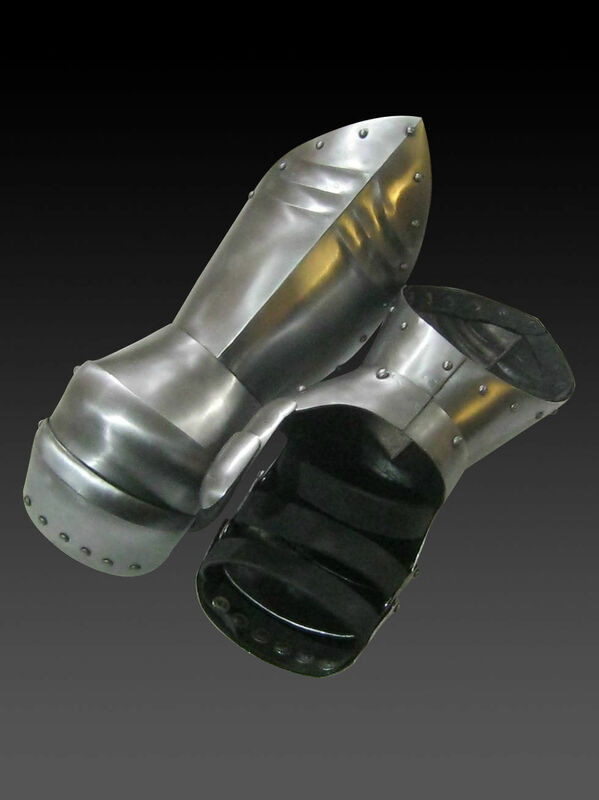 We make these knight gauntlets using personal parameters of customer. You can use this custom-made knight armor for: SCA HEMA Larp St..